That was the BIG NEWS from last week, although for most anime fans it matters little, as long as the anime keeps flowing. But the thing is that Starz sold Manga Entertainment and its parent company Anchor Bay to Anchor Bay’s managing director, Colin Lomax. This effectively means that Anchor Bay is an independent company again, and Manga Entertainment is beholden to one overlord only, the way it was ten or so years ago. It’s an interesting development given that many of the issues that fans had with the recent direction of Manga Entertainment could be put down to being contractually obligated to do things Starz’ way. Certainly the lack of Geneon titles in the UK was directly attributed to a refusal to jump through Universal’s contractual hoops. Now that one of the leashes around Manga’s neck has been removed, it will be interesting to see what effect it has, if any on future anime releases and licensing decisions. There’s no denying that there is room for improvement chez Manga. It will also be interesting to see what effect this has on new company Animatsu. They had a whole host of interviews posted online last week, revealing that Animatsu was set up to work hand in glove with Manga in some respects, handling marketing for Manga, while Manga dealt with distribution for both labels. You could read this as Animatsu acting as independent licensing wing for Manga. See the Otaku News interview. Andrew: The company came about from a combination of frustration and intrigue. We felt constrained by Manga’s parent company Starz and started asking ourselves “What if…” What if we had the opportunity to start our own label? How would we do it, and more importantly what would we do differently without certain restrictions? It becomes clear that the constraint has now been removed, and you have to wonder what Animatsu’s raison d’etre is now. It may just become the shortest lived label since Crimson Star Media, it may continue to exist until the recent reputational damage to Manga has been undone, or it might still just find a niche and the requisite unique selling points for it to thrive in the UK anime industry. Anime Limited announced last week (twice) that they have licensed the movie Miss Hokusai for UK distribution. They continue to acquire the unique and interesting titles that advance them towards their goal of becoming the Criterion of anime. Glasgow, UK February 26, 2015 - Anime Limited are thrilled to announce the release of Miss Hokusai in the UK and Ireland. Although this happens often enough for it to just be called news. We’re talking about delays of course, with most of March’s releases now being pushed back to April, including The Wings of Honneamise, and Kill la Kill: Part 2, although the latter is still scheduled for March 23rd. Tiger and Bunny: The Beginning’s standard release has been cancelled in favour of a Beginning and Rising twinpack, scheduled for a release alongside The Rising’s collector’s edition. But to fill the gap, the Standard Edition of HAL has been moved up to March, exact date to be set. Read more on their Newswire. Over the weekend, Manga Entertainment announced that the next four One Piece Collections (9-12) will be coming out this year starting in April. They also announced that One Piece Film Z will be here around May time. 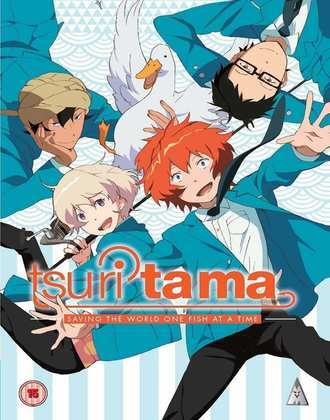 One review for you last week, and that was Tsuritama: Complete Collection. I have to admit to a soft spot for this show, with a bizarre premise that is just my thing. It’s about fishing, which is a genre that doesn’t exactly clog up my anime collection. We have a socially awkward teen who knows nothing about fishing, a ‘prince’ of fishing with a troubled home-life, a member of a secret organisation investigating mysterious occurrences at sea, and an alien who becomes the catalyst that creates and strengthens the bonds of friendship between this group. It’s a bizarre, wacky, easy-going and mellow sci-fi comedy of the sort that I haven’t seen since Niea_7, and it’s the kind of show that you simply have to watch because it’s so unlike anything else. And there’s a duck called Tapioca! MVM release Tsuritama Collection on their own Anime Online webstore tomorrow, as do most other e-tailers although Amazon have it listed for the 23rd of March.